In The Name of the Place is a complex collaborative project by the GALA Committee, initiated by artist Mel Chin for the Los Angeles Museum of Contemporary Art (LA MoCA). 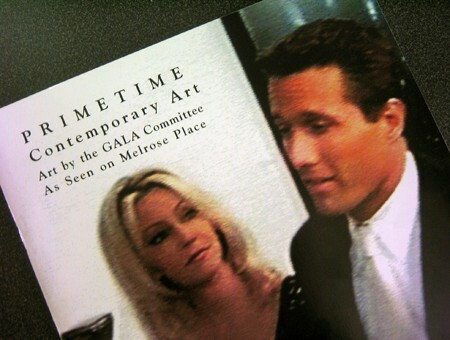 Working with the Uncommon Sense theme of public interaction, the GALA Committee selected a prime TV program, Melrose Place, as the site for creative a massive “condition of collaboration” among an array of individuals, institutions and interests, organized initially around the activity of developing and placing site-specific art objects on the program’s sets. During the two-season interaction, the art-enhanced weekly broadcast reached millions internationally. Radically expansive in form, with diverse aesthetics and a wide range of audience/artist television production involvement, In The Name of the Place is an experiment that illuminates unexplored, creative territory at the intersection of museums, mass media and artistic action.The culmination of the project is the public auction of the collectively-made art works. All proceeds from the auction will go to two non-profit educational organizations, the Fulfillment Fund and the Jeannette Rankin Foundation, to be used specifically to benefit women’s education.